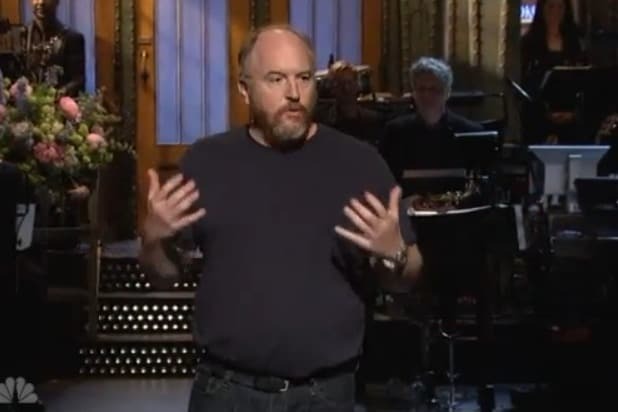 Louis CK thrives on controversy. So it should come as no surprise that the comedian served up a healthy dose of edgy jokes about child molestation, racism and Israel in his opening monologue when he hosted the 40th season finale of “Saturday Night Live” this weekend on NBC. The Emmy-winning star’s jokes about Israel and Palestine and child molesters were just as politically incorrect. CK closed his monologue with jokes about a child molester who lived in his neighborhood when he was a kid. After that, CK compared his love of Mounds candy bars to child molestation, adding that if offenders do it, knowing they can get caught, the act must be irresistible. CK also joked that because of his risque material, it would probably be his last time hosting “SNL.” But, if the studio audiences’ lively laughter and applause was any indication, CK will be back. Unfortunately, his sketches were extremely tame by comparison. The edgiest bit featured CK as a Sprint employee who made fun of the way his manager, a stereotypical sassy black woman, talked. When the manager caught him, CK’s character pretended to actually talk that way just to keep his job and as a result, had to keep up the ruse for five years. Two shorts featuring CK as a tearful lumberjack also garnered big laughs. Other sketches featured CK as a cobbler with overtly sexual elf employees, a man with a girlfriend with an annoying British accent and a member of an acting workshop in a police lineup. “Saturday Night Live” returns for its 41st season in fall 2015.